Though the medical field took note of sleep apnoea as early as 1965, it is only just recently that the public became more aware of this sleep disorder. In 2004, the sudden death of football superstar Reggie White due to sleep apnoea complications made headlines and has since allowed sleep apnoea emerge as one of the sleep disorders of top concern. Though its nature is not as serious as cancer, diabetes, and other more popular fatal conditions, sleep apnoea is equally threatening, much so is the undiagnosed and untreated case. Therefore, any person with suspected sleep apnoea should immediately undergo sleep apnoea tests to eliminate the possibilities of complications. Sleep apnoea diagnostic tests are done in sleep centres or laboratories by a qualified sleep specialist or a doctor. With technological advancements, a few tests can now be performed at home, although these tests should still be performed under the guidance of the attending physician. 1. Polysomnography. Because of its extensive nature, polysomnography is considered the standard test for diagnosing sleep apnoea and its severity. Polysomnography monitors and records activities of the brain, heart, and lungs; eye, arm, and leg movements; oxygen levels; air flow; breathing and respiratory patterns; and heart rate. It is used for all suspected cases of sleep apnoea and other sleep disorders. 2. Oximetry. The purpose of oximetry is to monitor the oxygen levels in the blood. It is an overnight test done at home and uses a sleeve that is fitted into the finger, which shows if there is an abnormality in the oxygen level. A low registry of oxygen means a case of sleep apnoea. Oximetry, however, cannot screen all cases of sleep apnoea, so doctors normally run polysomnography tests to confirm and validate oximetry results. 3. Multiple Sleep Latency Test (MSLT). Usually, performed to test excessive daytime sleepiness, MSLT measures how fast a patient falls asleep by allowing him opportunities to sleep during the day. People without sleep disorders normally fall asleep within 10 to 20 minutes, while those who have, especially those with sleep apnoea, do so in less than five minutes. 4. Portable cardio respiratory tests. These are simplified tests that are designed to use at home. They measure airflow and breathing patterns, among other things. However, these tests are only done with use of comprehensive sleep evaluation and upon the recommendation and supervision of the attending physician or qualified sleep specialist. After the diagnosis, the doctor or sleep specialist may refer another specialist or set of specialists to manage the cause and effect of sleep apnoea. These specialists include cardiologist (heart problems), psychiatrist (emotional and behavioural issues), neurologist (nervous system irregularities), and otolaryngologists (ear, nose, and throat abnormalities). Determining appropriate treatments must then take place after the diagnosis. 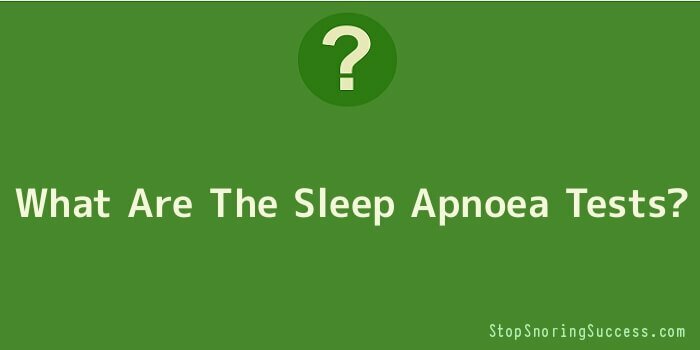 As it seems, taking sleep apnoea tests is the first step toward sleep apnoea management. If one has symptoms of sleep apnoea such as snoring, daytime fatigue, excessive daytime sleepiness, mood changes, and anxiety, going to a sleep specialist or doctor should be an immediate action.